--Definitely, absolutely, definitely use home made stock. --Start with miso ramen. It's easy to mix good miso paste into the hot stock and come up with a tasty version of miso-style ramen broth. I find it harder to get it right with shoyu (soy sauce flavor) stock. Shio (salt flavor)...fughedaboudit. --Don't use canned toppings. Might sound obvious, but it's tempting in terms of bamboo shoots. Skip it - they taste like the can. --There are exactly 47 ways to hard boil an egg. As a topping for this soup, you want the egg to be set but the yolk to be oozy. Therefore, you must use way #16 here. Put the eggs in the pot before you turn on the heat and let them rise in temperature with the water. When a low boil is reached, let them simmer for 4 minutes, then put the eggs in a bowl of cold water. --Put the broth in the bowl first, then the noodles. Maybe that's obvious, but I always used to put the noodles in and then pour the soup over them. Doesn't work as well. I made an approximation of miso ramen, except I used soba noodles. Used my own chicken stock as the base, a stock in which I used a lot of ginger. Toppings were chopped scallions, cooked spinach, shredded (leftover) chicken, and half of an oozy hard boiled egg (it's nice to salt the yolk). 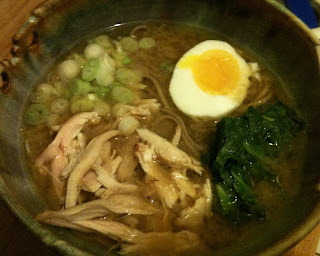 So that's the dish - miso soba noodle soup with a few toppings. Please, you be the sommelier. What would you serve with this dish? Leave your ideas in the comments and in a few days I'll share what I drank and whether or not it was a good match. The other night I was reminded of the the importance of proper storage as a factor in the life of a wine. Maybe that sounds trivial, but not to me. I'm aware of storage as an issue, and I know that the wines I've drunk in the very cellars where they were made are among the best wines I've had. Perfect storage, I guess, would mean that the wine never travels, no loading onto a truck, even if it is refrigerated, no bumpy ride to the coast, no sitting around on loading docks, no trip overseas, and then more trucks and warehouses, and more trucks to retail stores, and so on. Truly perfect storage is next to impossible, outside of the cellar that birthed the wine. By the time a bottle makes its way into my wine fridge it has already been through a lot. My job is to prevent any further degradation, to provide an environment that is consistently between 52 - 55 degrees Fahrenheit, and without light or vibration. Then again, some of the very finest wines I've had were not stored by me since their release. Those bought on the secondary market may not have been stored properly at all, I really don't know. Would they have been even finer had they been stored properly? Honestly, I don't care either way. Why sully the memory of great wines passed with questions like that. But there are little questions that I wonder about regarding the wines I am storing now. What if I need to move a wine fridge to another location - I have to take out the wines and leave them out for a few days while the fridge settles. The temperature will go way up, and then down again when I put them back in the fridge. If my wines are so fragile that they will be compromised because of this, well that's just too bad for me. And my friend who the other day I helped drive a few cases from his house to another location - he asked if driving and the bumpy trunk can hurt the wines. I really didn't know what to tell him. "Yes, they don't like the temperature change or the vibration" would be true, and so would "Ah, they'll be fine if you take them out of your fridge right before leaving, swaddle them in a blanket, drive carefully and not in the heat of July or August." If someone has done the science and can share practical storage and transport tips for the average wine lover, I'm all ears. But part of me feels like throwing up my hands and just not looking into this very deeply - it just doesn't seem like there's a whole lot I can do that I'm not already doing. That complacency was challenged, somewhat, when a friend served two wines over dinner at his house. He works in a wine warehouse, and these two particular wines had been sitting there in unopened cases for over 20 years. Temperature control, no light, completely pristine. They were both great wines, but the thing that struck me most about drinking them was how perfectly healthy they were, how well preserved and youthful, how vibrant and mobile and energetic they were, how much they changed in the glass over two hours. These wines are both from the 1983 vintage and should be mature. Both felt very young, however. Perhaps my understanding of what wine from 1983 (or from any old vintage) should taste like is colored by the fact that I so rarely drink wine that has been stored like these bottles were stored. 1983 Servelle-Tachot Chambolle-Musigny 1er Cru Les Charmes was simply a delicious wine. This is apparently the producer now called Amiot-Servelle, by the way. There are several interesting things to say about this wine, for example, that it reminded us more of Gevrey in character than of Chambolle, with its earthy red fruit. But the point here is storage - 1983 is not thought of as a good vintage, but this wine was very well balanced, quite complex, and very expressive. And the thing is, although the nature of the flavors was somewhat mature, the feel, the texture of the wine was youthful. Think of one of those 65 year old guys who surfs, does a lot of yoga, and eats very well - 65 becomes a random number when you are truly well preserved. 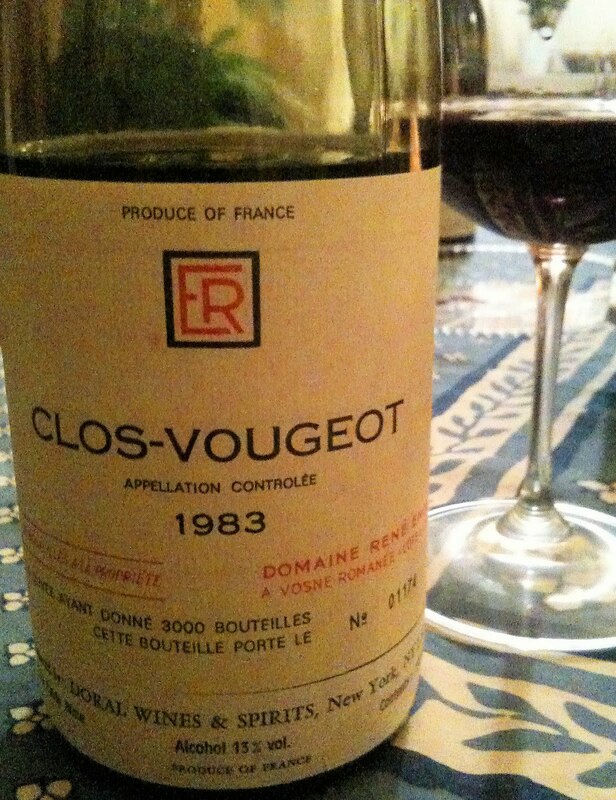 The 1983 Domaine René Engel Grand Cru Clos Vougeot was even more impressive. 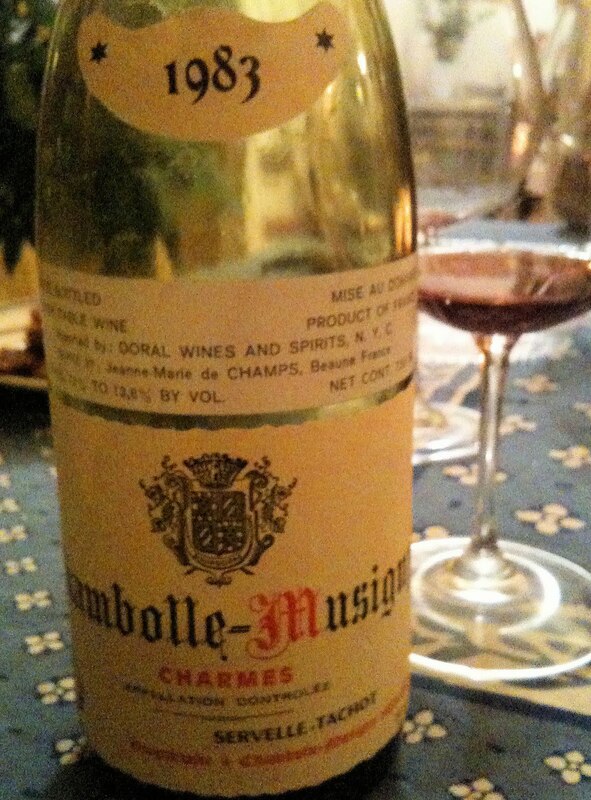 This wine is 27 years old but I would guessed about 12 years old had I tasted it blind. It was still dense with dark animal fur infused fruit, pungent and fresh. After about a half hour the wine became more about stone, showing a dark and cool mineral side. Fascinating wine, and full of pleasure. I've had a little bit of mature Burgundy before, and these wines were both striking in how young they felt. Not tasted, necessarily, and definitely not aromatically young. They felt young. And I must say, it was very compelling. I'm guessing it was a storage issue. Two friends came over for dinner the other night. These guys are wine professionals and we enjoy sharing interesting wines with one another, but nothing could have prepared any of us for the degree of geekery that occurred on this evening. I didn't tell them what I'd be serving for dinner, we didn't discuss the wines we'd be bringing, it was just a random thing, but everything we drank was the epitome of geek-wine. I don't aspire to drink geeky wine, and I'm not saying that geeky wine is by definition good wine - that would be absurd. I'm just saying that on this night, with a couple of serious wine lovers, it happened that we drank a lineup of incredibly geeky wine. And I loved it. 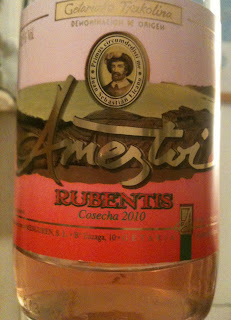 We started with the 2010 Ameztoi Getariako Txakoli Rubentis, $22, imported by De Maison Selections. You already know about Txakoli, the refreshing Basque country wine. This is a rosé, though, and there is hardly any rosé Txakoli made. I heard such wonderful things about this wine and bought some of the 2009. Liked it but didn't love it - I just thought it was straight forward fruity wine, not terribly interesting. This wine, however, I loved. Salty and herbal - think rosemary, zesty and fresh, and the effervescent texture is so lovely. There is some fruit but it;s not the main point of the wine. Note to self: find and purchase several bottles of this wine. 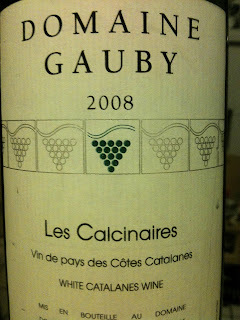 Then we drank the 2008 Domaine Gauby Vin de Pays des Côtes Catalanes Les Calcinaires, $27, imported by Weygandt Metzler. What, never heard of this wine? Me neither. It's a white wine from somewhere in the Roussillon; 50% Muscat, 30% Chardonnay, and 20% Macabeu, for you Macabeu fans and I know you're out there. Here are the specs, if you want to know more. I don't feel like we gave this wine enough attention that evening, but I drank the remaining half bottle the next day and it was delicious - quite intense, focused with acidity and minerals, and the texture is just slightly oily. I like that it is only 12.5% alcohol and very easy to drink. I'm not sure that I understand the price, as this is country wine from the Roussillon after all. But maybe this is one of those culty producers with a following and I just don't know about it. Then it was the 2002 Vodopivec Vitovska Venezia Giulia IGT, price unknown, imported by JK Imports. Maybe you already know and love this wine. The whole orange wine thing (and the whole Italian wine thing, really) kind of passed me by. I know nothing about this wine or about this type of wine, but here's the website. I've had only a few orange wines and this one was head and shoulders the finest one I've had. Brilliantly fresh and pure with mandarin fruit and perfectly harmonious. The wine changed a bit in the glass and got more and more complex. Just fantastic, a real eye-opener for me. And it was absurdly good with fregola, clams, basil, and dried red chili. 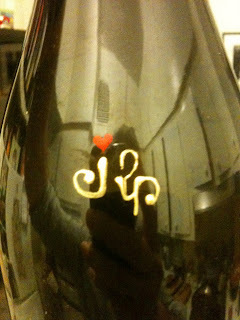 With skirt steak we drank the 2004 Els Jelipins Penedès, $72, Jenny & François Selections. This is that Spanish country wine made from very old Sumoll and Garnacha, a natural wine made by a lovely family who use solar power to run their winery and home. I've heard really good things and was excited to drink this bottle. It smelled great when we opened it - earthy red fruit, complex and deep. I decanted it and we got to it about a half hour later. By then, everything had gone wrong. Aldehyde and volatile acidity all the way, the fruit candied and it felt unstructured. This wasn't a flawed bottle and some people might love this wine, but I found little to enjoy. And lastly, with a slightly aged hard goat cheese, we drank an amazing Amontillado Sherry, the Valdespino Jerez-Xérès-Sherry Amontillado Tio Diego, purchased in Epernay, France for 20-something Euro, not imported. On the Fino-Amontillado continuum, this wine is as close to Fino as possible, while still being an Amontillado. This is what happens when Valdespino Inocente, quite possibly the world's finest Fino, becomes Amontillado, and it is completely delicious. It's butter (from the flor), salt, and roast nuts, and there is just the beginning of that burnished and deep Amontillado character. The finish is so long and combines lactic buttery-ness with salty nuts. Awesome wine. Geeky enough for you? I hope so, because we'll be back to regularly scheduled mainstream and most likely boring programming tomorrow. 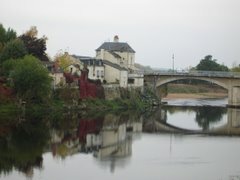 I was lucky to attend a dinner recently at which Levi Dalton poured a large selection of Jean-François Ganevat's wines. Domaine Ganevat is in the Jura, in a town called Rotalier. I could try to describe the estate for you, but I would just be sourcing Joe Salamone's excellent article on the Crush website. In a nutshell - this guy is a thoughtful farmer who makes very small quantities of more than 40 wines. His goal is to show the most specific expression possible of the many soils and grapes he farms. 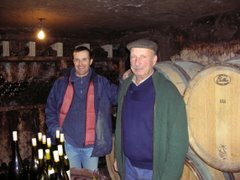 Jean-François Ganevat doesn't have a computer, doesn't use email, has no website as far as I can tell, has never been to the US, and is not particularly interested in promoting his wines. Ganevat's US importer Jeffrey Alpert also has no website and doesn't shout about these wines. They are just beginning to become a regular presence on the shelves of those retailers who care about Jura wine, and this is a testament to how good the wines really are - it's almost as if they are being kept a secret, and yet people are finding them. I've had only limited experience with the wines, but so far I'm a fan. I drank several bottles of Ganevat's Trousseau in the past two years and I like it very much, but it is very reductive upon opening and requires a serious decant. So do each of his reds actually, and of them it is the Poulsard (called Cuvée de l'Enfant Terrible) that I find most rewarding. The new vintage is 2009 and it's completely delicious. At the dinner I tasted a red called J'en Veux for the first time. This is a field blend of 17 grapes, none of which are known to wine lovers or scientists. The 2009 happens to be the one estate wine that Ganevat de-stemmed entirely by hand. That's right - in 2009 he used a scissors to remove almost all of the stem from every grape that went into this wine. It is highly aromatic, with bright fruit and flowers, ample in the mouth, and it just feels good. Light in body, low in alcohol (11%), with lovely and intense flavors, this wine will fascinate and delight you if you can find it, and should cost about $30. And by the way, shad roe with new potatoes and herbed mayonnaise was a great pairing with the red lineup. My first time eating shad roe (I know, I know) and it was an inspired pairing. Until this dinner I'd had only a couple bottles of Ganevat white wine, and I must say that I was very impressed. Considering the lineup of whites as a whole, I think that they might be as good as any lineup of white wines that I've tasted from the Jura. There are wines made from Chardonnay, Melon-Queue-Rouge, and Savagnin, and there are ouille (topped up) and sous-voile (oxidized) styles. Levi tested all of the wines before the dinner and at one point he said to me "The 2004 Les Chalasses...wow, it's drinking pretty well right now." Levi has not had an easy go of it lately, with the closing of his restaurant Alto, but that hasn't impeded on his ability to organize one hell of a wine dinner. And indeed it was. This is Chardonnay from vines of over 100 years old. The wine is topped up, but like many topped up wines, it has something of the same oxidative character that you find in the whites that are raised sous-voile. 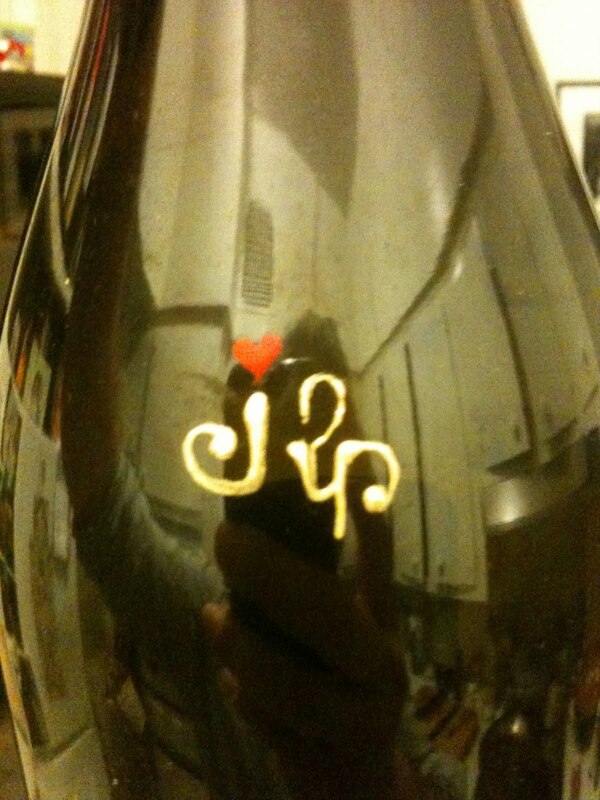 Or maybe, this character is actually a function of the Jura terroir, not a result of the type of elevage. Anyway, we drank Les Chalasses from 2004 and 2008, and I thought they were both excellent wines. The 2008 was vibrant and pungently mineral with great freshness and a core of energy that bodes well for the cellar. Several people preferred it to the 2004, but on that night I preferred the mature and elegant grace of the 2004. I loved the 1999 Les Vignes de Mon Père, a Savagnin from Chalasses vineyard, normally topped up, but this wine felt like a sous-voile wine (and Joe's article mentions that is because the wine was actually not topped up at the end of its elevage). The sous-voile wines were excellent too, including a show-stopping 2002 Vin Jaune. Jeffrey Alpert, Ganevat's US importer. The thing to take away here is that there are still great wine makers who make great wines that are not yet or just beginning to make it into the US. Jean-François Ganevat is one of them, and if you like Jura wine, these are worth a special search. Here are some wines that I drank in March that did not appear on this blog. The "excellent" group consists of wines that are truly memorable, wines that inspire me to seek out and buy these and wines like them. The "excellent" and "very good" groups are wines that I would happily buy at the given price. All other wines, even if I liked them, are not wines that I would buy today given my recent experience with them. Doesn't mean that I think they are bad wines, just means that based on the bottle I drank, there are other things I would prefer to buy with that money. 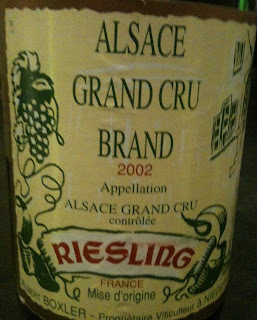 2002 Albert Boxler Riesling Grand Cru Brand, $35, Robbert Chadderdon Selections. A perfect bottle, great freshness and complexity, and it was beautiful with braised pork shoulder. Aromas of petrol and baking spice infused ripe orchard fruit. The nose becomes perfectly harmonious after a short time open. The palate is much drier than I expected, and is entirely delicious, with good acidity supporting the ripe fruit and the more mature secondary tones of petrol. Compelling and memorable. 2000 López de Heredia Rioja Rosado Gran Reserva Viña Tondonia, $24, Polaner Selections. With the 1995, this is my favorite vintage of this wine, so far. There is a kinetic energy here, a grippy texture that works perfectly for the diversity of flavors - orange oil, sherry, peach, salt...so good. Nothing else like it. And if you buy it as part of a case you're paying under $22. Kind of amazing. Emilio Lustau (Almacenista) Jerez-Xérès-Sherry Amontillado del Puerto Jose Luis González Obregón, selected by Christopher Cannan, Imported by Europvin USA, $37. Plenty of flor character in this wine, probably includes a decent proportion of wines that were under flor not too long ago. Fresh and complex aromas of butter, roast nuts, and even some dark fruit. Fantastically harmonious on the nose, and follows through on the palate, which is silky textured and offers great depth. 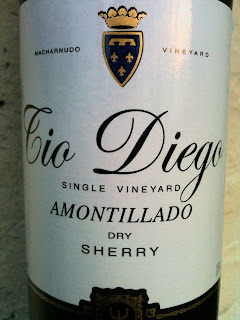 This is a very classy amontillado, and one to go back to again and again. 2009 Domaine Ganevat Côtes du Jura Cuvée de l'Enfant Terrible, $34, Jeffrey Alpert Selections. Another great Poulsard. This bottle showed best on day 2, after decanting the remaining half bottle. At it's best it is strikingly pure and fresh, absolutely inviting, with high toned cranberry and red currant fruit. There is a gamy undertone that also somehow seems very fresh and pure, and an unmistakable stony minerality that grounds the wine. The wine is cooling, very refreshing, and really just a beautiful drink. Perfect balance and structure, so the wine is seamless. On the first day, however, this is not the experience. It is delicious, but the structure sticks out a little, there is a rusticity that vanishes by day two, and the wine doesn't show the harmony that makes it so special. Decant a long time in advance, or really, just hang onto the wine for a while. That's what I'll do with what I have left. Laherte Frères Champagne Brut Tradition, $39, Imported by Selection Pas Mal. 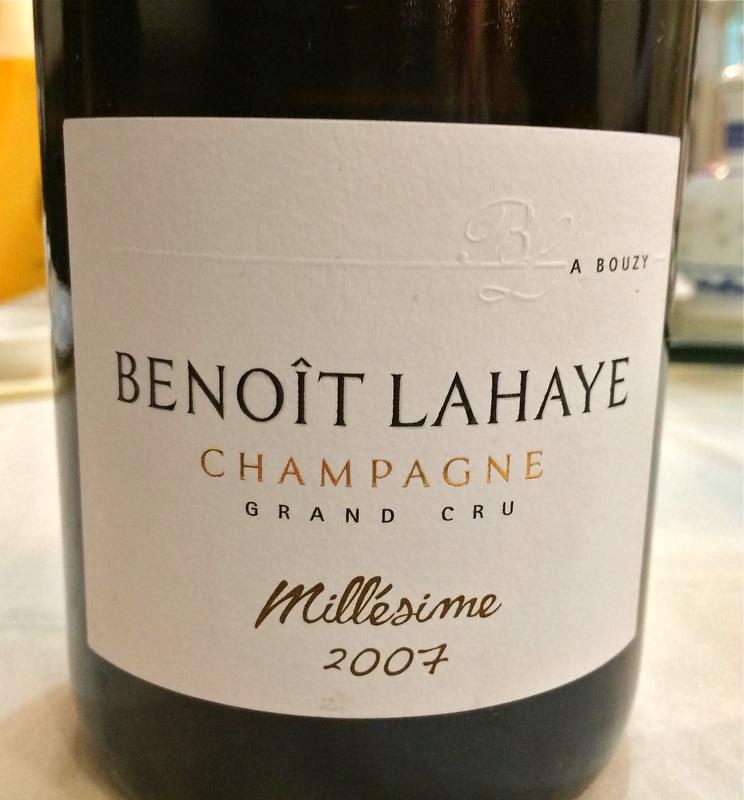 A truly lovely Meunier-based blend. This bottle is based on 2007, although 40% is reserve wine from 2006. Harmonious and classy, this wine shows delicious apple and quince fruit and good acidity, and there is a pleasant chalky undertone. Just a pleasure to drink, and a very good value. 2004 Château Rayas Châteauneuf-du-Pape Blanc Reserve, price unknown. A fascinating bottle of wine. The nose took a while to open, and was never loud, with waxy white flower and orchard fruit aromatics. I enjoyed the slightly oily texture of this wine, and the subtle salty complexity. White wine from this region is still a mystery to me, but this is one of the better examples that I've had. Jacques Lassaigne Champagne Les Vignes de Montgueux Blanc de Blancs, $45, Jenny & François Selections. This wine is always delicious, and this was a particularly good bottle. Broad and ample with very ripe fruit, and still firmly under control, with great acidity and freshness. Surely one of the best Blanc de Blancs from down in the Aube. 2006 Camille Giroud Aloxe-Corton 1er Cru Les Guérets, $36, Becky Wasserman Selections. I really appreciate the terroir expression in this wine, as the gamy and rocky earth of Aloxe is apparent. But something bugs me about what I experience to be a liberal application of oak. I have nothing against oak, as long as it doesn't jut out, and here it juts out a bit. that might change with more time in the bottle, but I'm not convinced that there is enough raw material here to absorb the wood. Diebolt-Vallois Champagne Brut Rosé, $60, Imported by Petit Pois Corp. I think this is based on 2007 and like the Diebolt 2007-based Blanc de Blancs, I'm just not crazy about it. The fruit is juicy and bright, but the wine is pretty simple and unmemorable, disappointing. 2009 Château de Pibarnon Bandol Rosé, $27, Imported by Michael Skurnik Wines. This is good, but I've preferred the past few vintages. the fruit here veers just a bit towards candied, and although there is some mineral complexity, the wine just kind of spreads out without much structure or acidity. 2009 Michel Brégeon Muscadet de Sèvre-et-Maine, $12, Imported by Kermit Lynch Wine Merchant. This was a bit fat and didn't offer the precision and detail that I've come to expect from this producer. 2009-itus, or perhaps like the past few vintages, the wine really just needs more time in the bottle? 2005 Jacques Puffeney Trousseau Arbois Les Berangères, $32, Imported by Neal Rosenthal Wine Merchant. Wow, what a disappointment! As hard as it is for me to say this...not every bottle of red wine from Puffeney or from the Jura is a good bottle. Here the fruit was candied and stewed, the tannins were harsh, the wine was fundamentally out of balance. Bad bottle...perhaps. Too young...perhaps. I'm not convinced. 2007 Domaine de Chantermerle Chablis 1er Cru Fourchaume, $25, Imported by Michael Skurnik Wines. Perfectly fine in that there is apple fruit, just enough acidity to make the wine drinkable, and the flavors are pleasant. But the wine has a flabby texture and a dilute midpalate, and does not really say anything to me about Chablis. Quite underwhelming, considering that other wines I've had by this producer have been quite good.